​New from AQX - Training and Certification for Floating Exercise Classes! "I cannot express enough gratitude for such an amazing course! Can't wait to start teaching such a wonderful course for all ages and fitness abilities :)"
Floating fitness is a new trend in programming. Performing exercises on an unstable SUP board or floating mat is exciting! AQXonFloats provides exercises to target balance, core strength, flexibility, and cardiovascular fitness. People can attend AQXonFloats training for personal interest or to prepare to instruct floating fitness classes. General fitness programs or specialized exercise like yoga, can be conducted on a floating board or mat ("Float"). 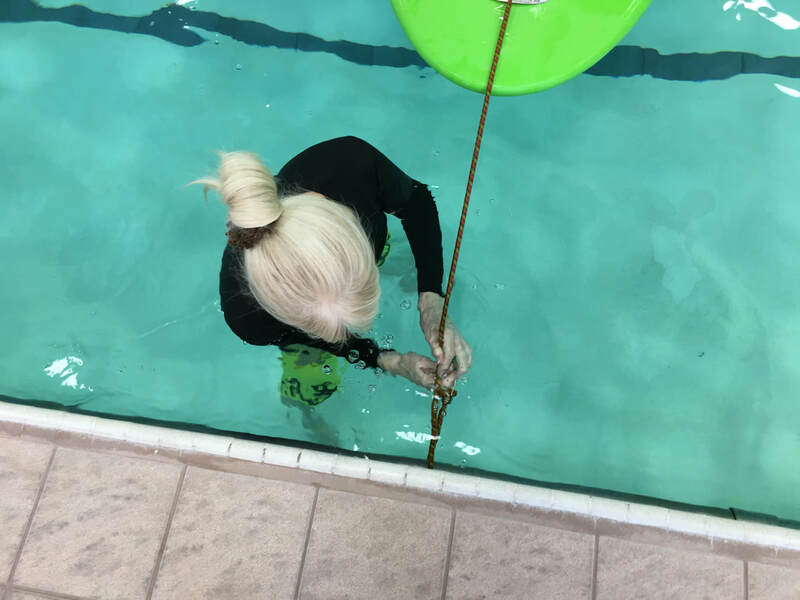 AQXonFloats pool classes can be used to prepare people for stand up paddling on SUP boards. However, using a SUP board in open water requires further training - beyond the scope of this program. AQXonFloats online dryland introductory course must be completed before registering for our practical pool training. Define suitable participants for floating fitness classes. Discuss class management and practice teaching strategies. Summarize exercise goals and guidelines for AQXonFloats pool classes. List guidelines for safe use of floats (boards / mats) in pools. Define inappropriate exercises / uses of the float. Outline class and program designs including: adaptations for warm water versus recreational pool temperatures; scheduling recommendations; consideration of pool characteristics; class template. Review program options and consider suitability specific to your facility and participant population. Engage in AQXonFloats class planning and practice teaching, emphasizing exercise objectives and class flow. Complete the AQXonFloats online dryland introductory course. This course prepares you for the AQXonFloats practical workshop or certification course. The online course includes a short theory exam and includes a certificate of completion. Please complete your AQXonFloats online training at least a week in advance of your practical pool course participation. Attend or request an AQXonFloats practical course at your facility. The practical pool course requires adequate floats for participants, classroom and pool time. Ideally, pool time will be 1.5 hours late morning; 1.5 hours late afternoon. A suitable classroom will be used during the rest of the day. Facility managers interested in hosting AQXonFloats training should get in touch about pricing and registration options. Successful completion of AQXonFloats online and practical training leads to Level 1 Certification. Anyone can take AQXonFloats training for personal interest or continuing education, rather than certification.